In this exercise, you will add the word copyright and use the Emboss effect to give it a watermark look. This is the same thing that professional photographic studios do to protect their images from illegal copying. Then you will drag that text layer over another image to apply the same text to that image. There are many effects that you can apply to type inside the Effects panel, including filters, layer styles, and photo effects. Filters can be applied to type, but the type must be simplified first. This means that the type is no longer editable; however Layer styles can be applied to type without simplifying the type first. Photo effects are applied to all the layers inside an Elements document. In this exercise, you will use a filter, and then later on, you will use a layer style. 1 Choose File > Open. In the Open dialog box, navigate to the Lessons folder and double-click the saddle1.psd file to open the file. You can also open the file using the Organizer, if you prefer. 2 Select the Horizontal Type tool ( ) from the Toolbox, and click in the middle bottom area of the image. 3 Type Photographic Productions Copyright 2010. 4 Click-and-drag to highlight all the text or press Ctrl+A (Windows) Command+A (Mac OS). Change the font to Myriad Pro by typing its name in the Font Name text field in the Options bar. Change the style to bold. 5 Change the type size to 30, by typing 30 in the Size text field. 6 Change the color of the type to white. Click the green arrow to accept the changes. 7 Select the Move tool ( ) and move the type to the bottom-right corner of the photo. Keep the type selected. The text added to the image. Now you will add a filter to make the type appear embossed into the photo. 8 Make sure the Filters button ( ) is pressed in the Effects panel. 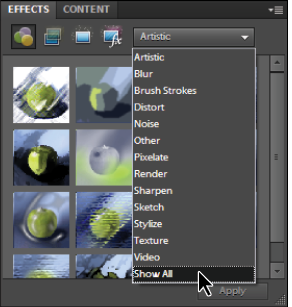 By default, the only filters that appear are the artistic filters. Click the drop-down menu to reveal all the other filters that can be applied. Choose Show All to see all the filters you can use. 9 Scroll down the list of filters to find Emboss. If you hover your cursor over a filter for a second, a tool-tip appears with the name of the filter. You can also select Show Names from the Effects panel menu ( ) to make identifying the filters easier. 10 Double-click Emboss to apply it. 11 A dialog box opens, warning you that the Type layer must be simplified in order to proceed. Press OK. This means that the type attributes will no longer be editable, but the filter will be applied to the Type layer. A warning dialog box appears when you simplify the type. 12 The Emboss effect is applied to the selected text and the layer is converted from a text layer to a standard layer. The finished layer with the Emboss filter applied.